After teaching BodyCombat at Goodlife Cannington, I decided to reward myself with a nice brunch at Harvest Espresso with two of my friends, Liju and Veng Li before heading home. So far, I have tried Harvest Espresso’s Autumn and Winter menu and the food was amazing. I was excited to see what Harvest Espresso has to offer for their Spring menu and I definitely have heard so many good things about it. 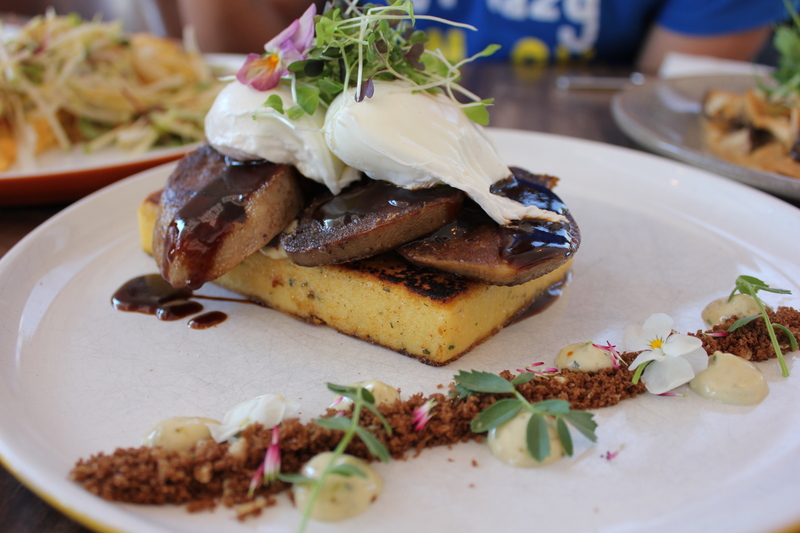 We had the Beef Tongue ($21.50) which comes with grilled polenta, sauce gribiche, poached eggs, rye and mixed seed. The beef tongue was one of the highlights of the Spring menu. This was my first time having beef tongue and it was oh so delicious and tender and complements well with the rich gribiche sauce. The polenta was soft and soaks up the well textured gribiche sauce like a sponge. Here is Liju’s review of the dish – This tongue is SO delightfully tender it came as a surprise. My experience with beef tongue was always on the chewy side at Korean BBQ restaurants but THIS beef tongue MELTS in the mouth, just like M’n’Ms. my only gripe was that there’s too little. I need a whole pile of this heaven. 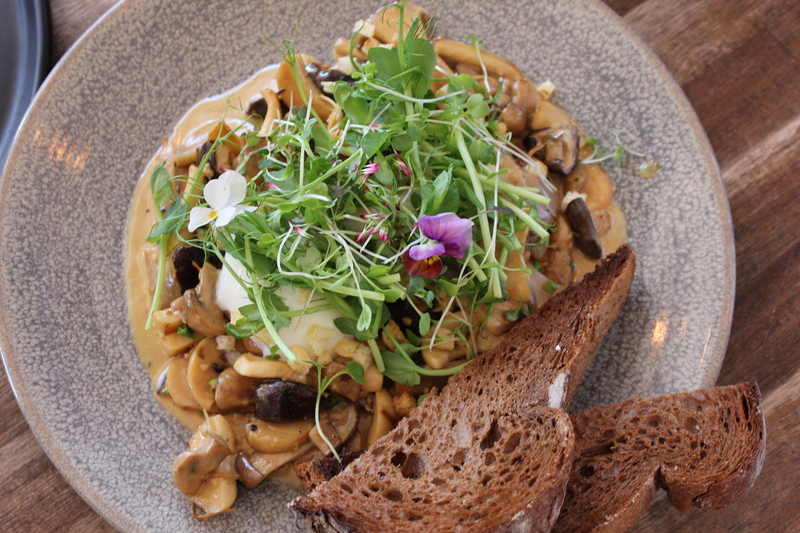 The Gourmet Mixed Mushrooms ($19.50) consists of slow poached eggs, creamy tarragon, croutons, pea shoots and toasted rye. There was a variety of mushrooms in this dish, from enoki, shimeji, oyster to shiitake. If you love your mushrooms, this is the perfect dish for you. It was well executed with different hints of earthy flavours from the mushrooms, blending well with the creamy tarragon sauce. Liju’s review of the Gourmet Mixed Mushrooms – Vegetarian dishes are not my thing. But THIS one, yeah i’ll take it any day. Deliciously creamy with perfectly cooked mushroom medley. The 2 poached eggs nestled in the mushrooms really lifts it to a different dimension. Very well executed dish. 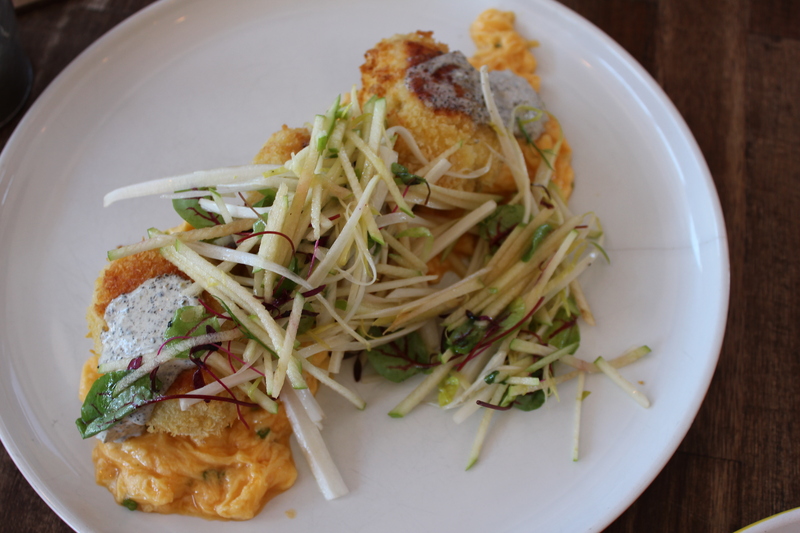 We also had the Salt Cod Brandade Fritters which comprises of scrambled eggs, apple witlof salad, nori fennel and sour cream ($22.5). Here is Liju’s review of the Salt Cod Brandade Fritters – Individually, the components were delicious! crispy on outside pillowy inside lovely morsels of fish and potato, buttery and perfectly scrambled eggs, fresh witlof and apple salad. It’s a good dish for sure, but maaaan sitting beside the other dishes we had, this one took a longer time to finish. Next, we had the Pineapple and Almond Baked Slice ($16.50) which comes with lemongrass foam, yuzu pearls, pineapple gel and fried quinoa. When the dish arrived, it was so beautifully presented with fine attention to detail. The pineapple and almond baked slice was light, moist and not too dense. The flavours also marries well together. One bite and your tastebuds will be dancing for joy. 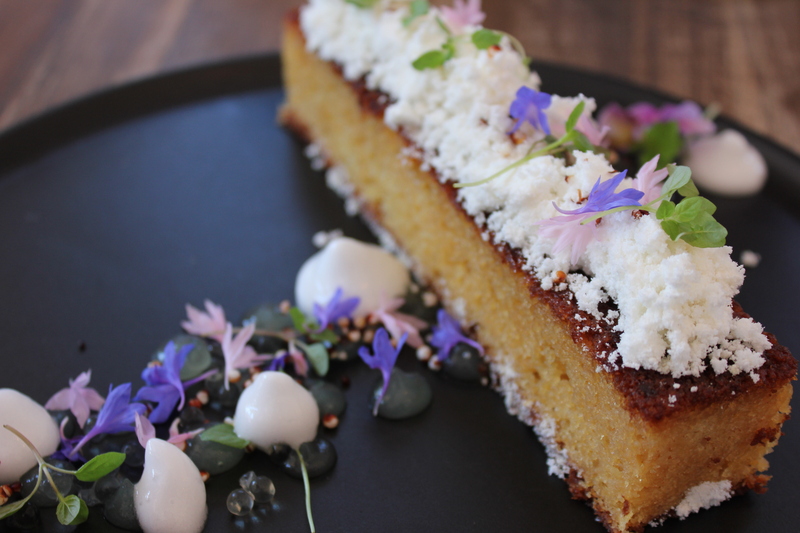 Liju’s review of the Pineapple and Almond Baked Slice – The cake was such a pretty picture and it was initially too good to eat. Then after our first mouth, it was too good to stop! Warm, moist,flavourful, playfully textured and well balanced. So good. We also shared a Cronut and Carrot Cake. 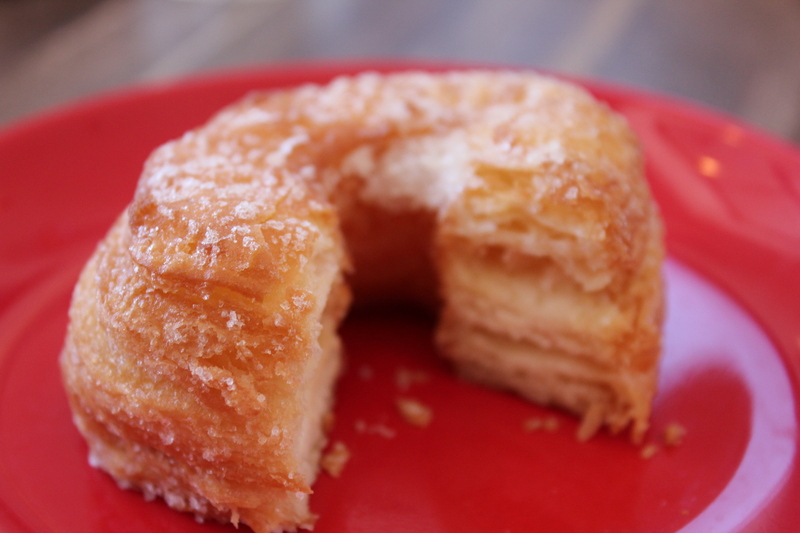 The Cronut was light, fluffy and melts in your mouth. 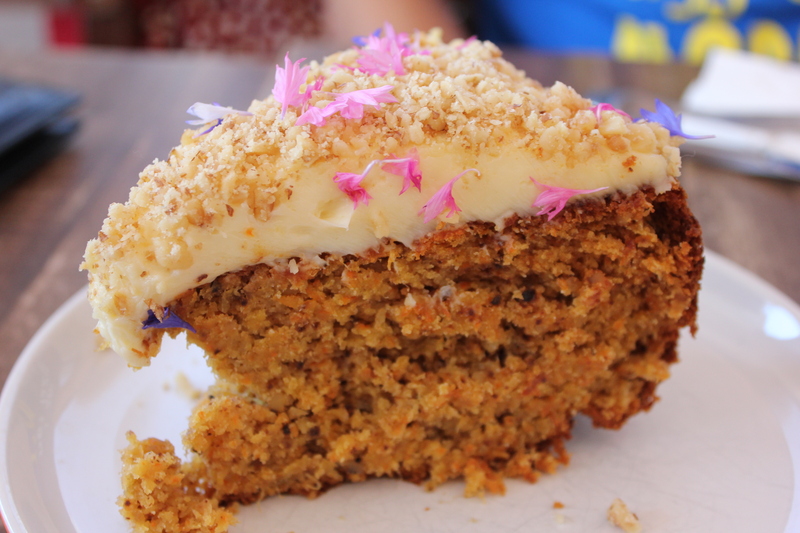 The Carrot cake was moist and it was not too dense with a nice balance of sweetness. After our big feast at Harvest Espresso, we were all so full and satisfied. Harvest Espresso has done it once again – well executed food, great coffee and a lovely atmosphere. Now I am looking forward to see what Harvest Espresso has to offer for their Summer menu. Bring on blue skies and sunny days! Damnnnn! I’ve not had the cronut, the salted cod fritters or the pineapple cake but I have to say, the scrambled eggs looks PERFECT! Never had a disappointing meal here! I’ll vouch for the pineapple and almond slice, beautiful and delicious!